I took these shots a couple of weeks ago and have been meaning to post them, but for whatever reason haven't gotten around to it. I did not take many pictures this weekend so I thought I would use them for Best Shot Monday. The first one is actually my favorite, but I liked how they worked all together too. 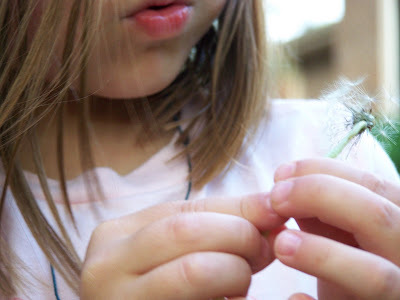 The shots are definitely imperfect, a little blurry, and I wish you could see the dandelion better, but still very sweet. Head over to Tracey's to see some more great shots. Don't forget to enter the Barefoot Book Giveaway. The contest ends tomorrow. 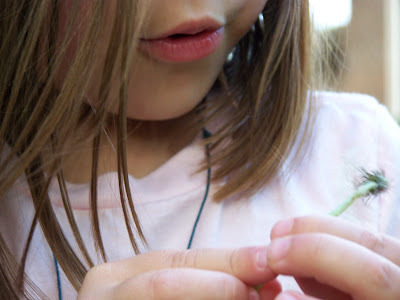 Lil Girl and I found some dandelions recently ourselves: she was delighted to watch the seeds go flying. (Of course the wind blew it all back towards us, but that was half the fun.) These capture the spirit of that so well! Those are so cute! I love the framing! 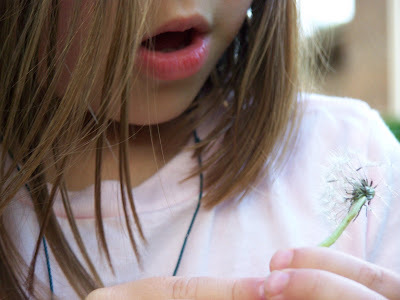 What a great series - what kiddo doesn't love to blow on dandelion puffs?! Love the series. Harrison loves to blow the dandelions when we find them. You'll have to post pictures of your butterflies when they emerge! We'll be setting ours free on Wednesday, I think.